Does It Take Longer to Cook With the Bone in or Out? Boneless lamb roasts take longer to cook than bone-in versions. 4 What Does Spoiled Meat Smell Like When Cooking? Many argue that bone-in cuts of meat or poultry are more flavorful than their boneless counterparts are, but if you're in a hurry to get dinner on the table, you may opt for boneless cuts. In some cases, boneless portions cook faster -- but not in all cases. Depending on the type of meat or poultry you're using, bone-in may be the way to go. Chicken pieces certainly do cook faster if they're boneless. For example, a boneless breast half can take as little as 20 minutes to cook in the oven, versus a minimum of 30 minutes for a bone-in breast half. However, many cuts of meat like beef rib roast and pork roast cook in the same amount of time whether bone-in or boneless. 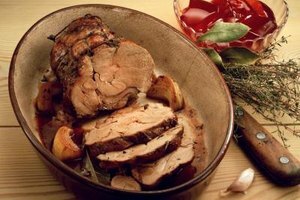 Lamb is one exception; a boneless lamb roast will take longer to cook than a bone-in roast. In any case, use a meat thermometer to gauge the internal temperature of meat or poultry to ensure it reaches a safe temperature before consuming. Kelly McCoy has been writing for lifestyle blogs and online publications since 2010, specializing in recipes and techniques for the home cook. She holds a B.A. from Boston University and J.D. from the University of Hastings College of the Law in San Francisco. Does Chicken Cook Faster With or Without the Bone? How Much Does 1 Pound of Ground Beef Cook To?